Review: A Small Firm, But Potentially a "Best" Option? How Does Landmark Credit Repair Work? Our review of Landmark Credit Repair (Landmark) has yielded a fair number of pros and cons for those considering their services to weigh. When it comes to choosing a credit repair agency, customers have a seemingly endless list of choices. Landmark is unique in that they are a small company that has been positively recognized by the Better Business Bureau (BBB). That is an achievement not many credit repair agencies can include on their resumes. Here’s an in-depth look at Landmark. We will look at how the company started. In addition, we will look at how they work to help clients. We will also give you a rundown of what people are saying about the company. We’ve also included what we like and don’t like about Landmark. Landmark Credit Repair did not rank in the top 5 in our research of the best credit repair companies. For a credit repair company, Landmark has some great positives. As we mentioned before, the company boasts BBB accreditation. In addition, they have some offers that can really help customers. They also offer a satisfaction guarantee. They’re a small company, but still have some industry success to tout. Here’s what we like about Landmark Credit Repair. If you visit their site and are interested in talking to someone about opening an account, you can fill out a form for one of Landmark’s free guides on how to raise your credit score. This is a smart approach. Instead of having a potential customer wait for someone to call them back, they can review the guide. When it comes to the sales call, Landmark prefers to educate. They do this rather than pressure to make a sale. They believe in education-based sales, and try to find a program that’s best for the client. Landmark is both accredited by the Better Business Bureau and has an ‘A+’ rating with the bureau. Unlike many other credit repair companies, Landmark has more positive reviews than complaints. However, they do have negative reviews on other websites. Landmark allows customers to put their account on hold if they need a break or run into life problems. They also emphasize building a relationship with their customers. They have monthly update calls with clients to stay on track with accounts. During the free consultation, a Landmark representative assesses a customer’s goals. That can include buying house, car, job, etc. The customer’s goals determine how Landmark approaches credit repair. According to Landmark, building and using credit, restoration and settling debts can all have a different impact on your credit. Those factors could impact how and when you can achieve your goals. A Landmark representative will determine what approach to take to restore credit so customers can reach their goals. There are a lot of positives. However, there are still some areas where Landmark can improve how they provide their services to customers. This is especially true when it comes to money and service guarantees. Here’s what we don’t like about Landmark Credit Repair. Landmark offers a 90-day satisfaction guarantee. If you are not happy with the results within the first three months, you can get your money back for their service. But they also say that it takes from three to eight months to see any results. This means you could wait up to eight months without seeing any results, but you wouldn’t be able to get your money back because the time limit for the guarantee would have passed. One of the mentions in Landmark’s videos that we noticed was that they do not charge a high fee to set up. However, we noticed multiple reviewers who said they paid $249 to set up their account. It’s important to be critical when looking at reviews online. However, it is telling that more than one review mentioned the same amount in the same context of setting up an account. The Credit Repair Organizations Act is clear: credit repair companies cannot charge for services in advance. If Landmark does charge a fee to create an account, it’s essential that they be clear about what this charge is, what it’s for and when you pay it. Many online reviews of Landmark are positive. However, we would caution that there aren’t many online reviews for the company overall. For the following, we looked at Landmark reviews on the website for the Better Business Bureau and Facebook. There are currently two complaints on their BBB page. The company has answered both of those. Reviews also suggest that Landmark doesn’t just work to help clients with credit. They also provide education and help clients watch out for major issues. Those include how to deal with creditor calls and identity theft. People can use Landmark for most credit issues. That is particularly if bad credit is getting in the way when applying for a job, a home loan, a new apartment or car. Aside from a low credit score, there are other indications that it might be time to contact a credit repair agency. Those would be getting high interest rates on a loan for a car, being turned down for the car you want and/or being refused an apartment or job. Based on Landmark’s reviews, customers can expect to receive education on the best ways to manage credit. Have further questions about credit in general? Then Landmark may be the right company for you. However, many credit repair companies offer education in addition to credit restoration. Before starting the process with any company, including Landmark, we recommend doing your research to find the best company for you. What differentiates the company is their focus on values. The company has a weekly prayer meeting with staff. They pray over their clients and cases. In addition, based on what we found the company offers customers the option to put their account on hold. They say these items can be disputed in a credit report. However, that doesn’t mean they can be removed permanently if you sign up for Landmark’s services. The U.S. government’s consumer site offers advice. It says that a company that promises to remove negative information regardless of whether or not that information is accurate is a sign that the company is operating a scam. Each case is different. However, when speaking to your representative, make sure that you’re getting the information you need. You want to make an informed decision about your credit report and score. How Does Landmark Credit Repair Work to Repair My Credit? Landmark’s program is a four step process they designed to help customers repair their credit. They help customers learn how to manage credit moving forward. According to Landmark, the first step of the process is to help customers ‘…build or utilize the credit [they] have better.’ This means helping customers get the right types of credit, such as secured cards. The second step involves credit restoration, where representatives at Landmark speak to credit reporting agencies, collection agencies and creditors. Third, Landmark provides customers guidance on settling debts. When it comes to paying off old debts, most people think paying off debts is a good thing. Sometimes doing this leads to the account being labeled a “paid collection” or “charge off” and could cause a drop in credit score. The last phase in the process is where Landmark provides consulting services. At this step Landmark looks for violations in a customer’s report and prepares their file as if it would be going to court. Even though Landmark outlines what their process is for credit repair, legally they must outline “all the services to be provided” to you. Make sure you understand all this information before signing up for an account. How Much Does Landmark Credit Repair Cost? There isn’t much information about how much Landmark’s services will cost, but we did find some information in the complaints posted on BBB that could provide some clues. Two people complained the company charged their credit cards $249. Though critical, both reviews mentioned that this fee was a processing fee. Those reviewers also mentioned that the monthly fee was around $90 (one review said $89, the other review said the monthly fee the company quoted to them was $90). Considering that on average, Landmark’s program takes anywhere from three to eight months, the total cost of signing up with Landmark could be anywhere between $519 to $969. As with other credit repair companies, opening an account with Landmark begins with getting one of their free consultations. Consultation calls are not only a chance to review a potential customer’s credit report and score, they are essentially sales calls where an agent will try to convince a caller to sign up for services. One of the reviewers online mentioned that a customer was recorded saying that they agreed to be charged for Landmark’s services, and that they gave an agent their credit card number and information over the phone. Part of the free consultation includes access to a guide on fifteen ways to raise credit scores. The Landmark website has a form you can fill out to get this guide, so if you don’t call their office but sign up to get the guide, someone from Landmark’s team will contact you for the free consultation. 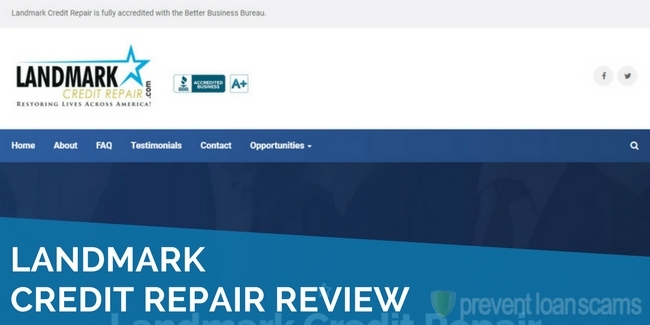 What Results Can I Expect from Landmark Credit Repair? The amount of time it takes to see results from Landmark will vary depending on how many accounts are on your credit report. In a video outlining the company’s four pillar program, the founder Brad Young says that on average it takes 3 to 6 months for up to 10 accounts, and 4 to 8 months for 10 accounts or more. Based on reviews of the company, we would say this information appears to be consistent. A couple reviewers said they saw improvements in their credit after working with Landmark for a month. Other reviewers mentioned that they improved their credit scores after working with Landmark for a year. Who Is Landmark Credit Repair? The business opened in 2000, and is a small company led by a management team of four people. The company has strong ties to its community. The CEO Brad Young regularly speaks at church events and conferences. Who Owns Landmark Credit Repair? Brad Young is Landmark Credit Repair’s CEO and Founder. He spent 15 years working for other credit repair companies, including two of the biggest companies in Texas, before starting Landmark in 2000. Brad started Landmark because he was fed up with seeing customers pay a lot of money for credit repair, but getting poor customer service in return. Where Is Landmark Credit Repair Located? Landmark is based out of Tyler, Texas, a city located about 100 miles from Dallas with a population of over 100,000. Many people know the city for being home to one of the largest churches in Texas, Green Acres Baptist Church. Does Landmark Credit Repair offer a guarantee? Landmark offers a results guarantee: “If you don’t get results in 90 days, you get your money back” (according to the company’s CEO). Some reviewers mentioned that after trying to get a resolution on their account, they gave up because they had not received a resolution to the issue by the time the 90 day period had passed. Beyond 90 days, customers may need to be persistent in contacting the company if they are unhappy and want a refund. Can deleted items reappear on my credit report after my credit is repaired by Landmark Credit Repair? If Landmark has truly repaired your credit, no items should reappear on your report (unless an error has been made by a reporting agency or creditor). But this is true of any credit repair or restoration process, even if you take steps to repair your credit yourself. If you choose to hire a repair agency to restore your credit, make sure that they’ve given you all the information you need to track your progress. How Long Does Landmark Credit Repair Take to Repair Your Credit? Depending on how many items you have on your credit report, the process could take anywhere from three to eight months for Landmark to repair your credit. According to Brad, cases with 10 accounts or less on their report can take from three to six months. Credit reports with more than 10 accounts can take up to eight months, again, on average. These timelines are general guidelines. How long Landmark will take to repair your credit may vary, regardless of how many accounts you have on your report. Is There a Couples, Family or Active Military Discount? Based on our research, there are no discounts for couples, family or active military for joining Landmark Credit Repair. If discounts or other perks are important to you, try researching other repair agencies and looking at what they have to offer. Or if you want to sign up for Landmark’s services, consider asking your representative if you can have a discount for military service, or for signing up a family member or partner. What Are Landmark Credit Repair’s Hours? Landmark Credit Repair is open Monday to Friday from 9 a.m. to 6 p.m., and on Saturdays from 9 a.m. to 2 p.m.
What is Landmark Credit Repair’s Phone Number? How do I cancel an Landmark Credit Repair membership? Contact your Landmark representative to cancel your account. We’d also recommend sending the company an email so there’s a record of when you contacted them to end the service. I canceled my service not for my score not moving, but I only heard from them when I had my consultation and when my payment didn’t go thru. I know I did not do my part sending letters, etc. But never received a follow up call for letters or email. I got a response back same day when I canceled. Not saying they are bad, I just expected more for $99 month and $249 to start up. Thank You for what you started.